The fall of that wall in 1989 signalled the reunification not only of Germany but of the entire European continent, and the end of the Cold War. It also marked a European commitment to providing asylum to people fleeing from persecution. Unfortunately, history often repeats itself and citizens forget. Thus, walls and fences have been proliferating in Europe over the past 12 years as a response to migration flows. The most famous wall of them all. It was as early as 1995 when the first project for building fences around the Spanish enclaves of Ceuta and Melilla on the North African coast started. It was completed in 2000, three-quarters funded by the European Union for a total cost of €48 million. However, the continuing attempts by desperate migrants from West Africa to storm the two fences in 2005 led to the construction of a third fence around Melilla for an additional cost of €33 million. The fence around Ceuta was further fortified, rising from three to six metres high. These fences were not conceived of as being properly European as they were built around extra-European territories on the African continent. Europe in the meantime, continued its path towards closer integration, including the full implementation of the Schengen agreement and its abolishing of border provisions. The next barbed wire fence, not quite a wall, was erected by Greece in 2012 in an effort to seal its land border with Turkey. This was a relatively unsophisticated fence that ran through the land strip of the Greek northeastern border with Turkey for 12.5km. It was originally budgeted at €5.5 million but eventually cost €3.16 million. The fence was fully financed by Greece, as the European Commission refused to contribute. The fencing that has shocked Europe the most was built by the Hungarian authorities in 2015 to seal their 175km border with Serbia and with Croatia (another 350km long). This caused despair among asylum seekers travelling through the “Balkan route” to northern Europe, and diverting flows through Croatia and Slovenia. Fencing the Hungarian-Serbian land border cost €106 million. And now Donald Trump has ordered the extension of the wall that divides the US from Mexico from its current 1,000km length to cover the full extent of the 3,200km border. 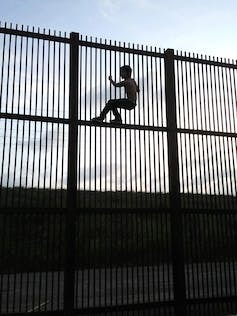 Scaling the US-Mexico barrier in Texas. Trump has said his wall will be “impenetrable, physical, tall, powerful, beautiful”, and will run for about 1,600km while natural obstacles and the existing barrier will cover the rest. The barrier that already exists for a good part of the Mexico-US border includes different structures of relatively short walls and sections where the wall is “virtual”, implemented by radars, drones and other high-tech surveillance equipment as well as border-guard patrols. This physical barrier runs through both urban terrain and desert crossings across California, Texas and Arizona, encompassing those areas where the highest number of illegal crossings were registered in the past. In the face of all this wall-building, the question arises: do walls work? Do they stop population flow, and at what human, material and political cost? While arguments proliferate both against and in favour of such radical enforcement measures, little is said about their costs – both direct and indirect – and about their effectiveness in curbing migration or asylum-seeking flows. In a recent study, Douglas Massey, Jorge Durand and Karen Pren demonstrate that despite a 20-fold increase in nominal funding for border control in the period between 1986 and 2008, the undocumented migrant population in the US has grown from an estimated three to 12 million people. They also found that the border patrol budget leapt from approximately US$300 million per year in the mid-1980s to just under US$4 billion in 2010. The money has been spent on personnel and the high-tech enforcers of walls such as drones, sensors, helicopters, planes and satellites. The existing US-Mexico border wall runs for 1,000km. A similar study on the costs of migration control in Greece has shown that during the period 2010-2012, Greece multiplied its border personnel, increased technical capacity and implemented a blanket detention policy for all undocumented arrivals, including those who applied for asylum. This cost €67 million without effectively curbing irregular migration. From 2007-2012, Italy spent €1.7 billion on external border control as well as technology systems to improve surveillance, repatriation programmes, centres hosting undocumented migrants, and developing cooperation with third countries to combat illegal immigration. But the number of undocumented migrants residing in the country did not significantly decrease. In both Greece and Italy, as well as in the US, it was regularisation programmes that effectively curbed irregular migration rather than walls and the machinery of enforcement. These programmes, otherwise known as amnesties, give undocumented aliens a chance to legalise their residence status under certain conditions: usually a clean penal record, having been in the country for a number of years, having a job and showing signs of integration in their local area, such as renting a flat or sending their children to school. Such programmes usually come once a country admits that irregular migrant workers provide a much-needed labour force and to expel them would be both inhumane and counterproductive for the host society’s interests. Regularisation programmes in Europe and North America have varied in size from a few hundred cases (for example, ad hoc programmes in the UK or the Netherlands for rejected asylum seekers) to hundreds of thousands (in the US in the 1980s and in southern Europe through the 1990s and early 2000s). On the other hand, studies have consistently found that the results of enforcement have been mediocre and often carry unintended consequences: most commonly, routes are shifted to remote areas with particularly difficult environmental conditions. The use of migrant smugglers becomes the norm and their fees increase. In the US, tight border controls have led the undocumented migrant population to settle north of the border, instead of keeping families back home and moving between the two countries. In other words, walls and heavy militarisation do not lead to an overall decrease in irregular migration. And their environmental costs are significant, while the human costs of separating families are truly non-quantifiable. While countries need to keep their borders secure, there is no escaping the fact that irregular migration is a complex phenomenon. Regularisation programmes and the provision of legal migration channels are much more effective – in material, human and moral costs – than any border fence can be.